Trading allows the investor to place an order 24 hours a day, anywhere and anytime. Check your orders by selecting order status. 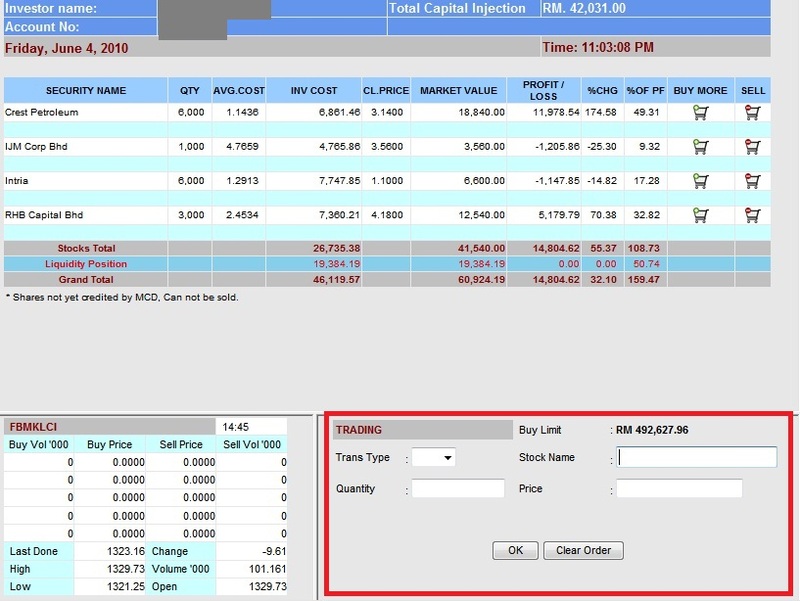 View outstanding positions and know which shares are pending settlement. All orders entered between 8.30am to 9.00am for the morning session and from 2.00pm to 2.30pm for the afternoon session, are randomised. The central SCORE computer system will decide on the sequence in the order queue based on a randomised algorithm for all orders input during the period. Orders entered after 9.00am and 2.30pm will be on a first come, first served basis. For trading, enter the Stock Symbol from the Stock Symbol List available to you, or click Search to search for the counter name. For this Demo, key in GENTING. Select Action to Buy. Enter the number of shares to buy as 1000, and price of RM6.10. Click Ok.